This paper investigates the place of trust in a school context and its importance in achieving the aims of schooling, “namely high academic performance and positive affects among members of the school community” (Forsyth, 2008). The role of trust in the use of technology and technological change is examined. Literature is surveyed in the fields of trust in the school community and trends which are impacting technology use in schools. The concept of collaborative and participatory culture in particular is examined. Digital citizenship is presented as a necessary component of an educational technology program. Some general suggestions for developing a culture of trust are presented. Jacqui is a primary school teacher and mother of four children living and working in Brisbane. She has been teaching in the Queensland education system for more than twenty years in state, independent and home schools. Jacqui recently completed a Master of Education at Griffith University. She has a particular interest in educational technology and the cultural implications of technology use in schools. She blogs about trust in schools at www.trustineducation.wordpress.com. Botsman, R., & Rogers, R. (2010). What's mine is yours. The rise of collaborative consumption. New York: Harper Collins. Bryk, A. S., & Schneider, B. (2002). Trust in schools. A core resource for improvement. New York: Russell Sage Foundation. Bryk, A. S., & Schneider, B. (2003). Trust in Schools: A Core Resource for School Reform. Educational Leadership, 60(6), 40-45. Buckingham, D. (2007). Beyond Technology. Cambridge: Polity Press. Christian, K., Morrison, F., & Bryant, F. (1998). Predicting kindergarten academic skills: Interactions among child care, maternal education, and family literacy environments. Early Childhood Research Quarterly, 13(3), 501-521. Epstein, J. (2001). School, family, and community partnerships. Boulder, Colorado: Westview Press. Epstein, J. (2002). School, family, and community partnerships. Your handbook for action. (2nd ed.). Thousand Oaks, CA: Corwin Press. Forsyth, P. B. (2008). The empirical consequences of school trust. In W. K. Hoy & M. DiPaola (Eds. ), Improving schools: studies in leadership and culture. Charlotte, NC: Information Age Publishing. Friedman, T. L. (2006). The world is flat. New York: Farrar, Straus & Giroux. Gaffney, M. (2010). Foreword. In M. Lee & G. Finger (Eds. ), Developing a networked school community. A guide to realising the vision. (pp. v-vii). Camberwell: ACER. Henderson, A. (1987). The evidence continues to grow: Parent involvement improves student achievement. Annotated bibliography. National Committee for Citizens in Education. Columbia, MD. Henderson, A., & Mapp, K. (2002). A new wave of evidence: The impact of school, family, and community connections on student achievement. Austin, Texas: Southwest Educational Development Laboratory. Herther, N. K. (2009). Digital natives and immigrants: what brain research tells us. Online 33(6), 15-21. Holmes, B. (2010). Parent perspectives on the digital home-school nexus. In M. Lee & G. Finger (Eds. ), Developing a networked school community. A guide to realising the vision. (pp. 171-186). Camberwell: ACER. Hoy, W. K., & Kupersmith, W. (1984a). Principal authenticity and faculty trust: Key elements in organizational behavior. Planning and Changing, 15(2), 80-88. Hoy, W. K., & Kupersmith, W. (1984b). The concept of trust: An empirical assessment. Paper presented at the American Educational Research Association. Hoy, W. K., & Kupersmith, W. (1985). The meaning and measure of faculty trust. Educational and Psychological Research, 5, 1-10. Internet Safety Technical Taskforce. (2008). Enhancing child safety and online technologies. The Berkman Center for Internet and Society at Harvard University. Isard, J. (2013). Can e-learning be as effective as classroom learning. Education Technology Solutions, April 2013, 37-40. Johnson, L., Adams, S., & Haywood, K. (2011). The NMC Horizon Report: 2011 K-12 Edition. Austin, Texas: The New Media Consortium. Kirkman, J. (2012). Don't panic! A hitch hiker's guide to teaching the digital native. Professional Educator, 11(3), 7-9. Knight, E. (2012). RFC: An Open, Distributed System for Badge Validation. Working paper. Mozilla Foundation. Larkin, K., Finger, G., & Thompson, R. (2010). Student health and welfare in networked school communities. In M. Lee & G. Finger (Eds. ), Developing a networked school community. A guide to realising the vision. (pp. 277-289). Camberwell: ACER. Lee, M. (2010). Schools and the digital technology: An overview. In M. Lee & G. Finger (Eds. ), Developing a networked school community. A guide to realising the vision. (pp. 33-50). Camberwell: ACER. Lee, M., & Gaffney, M. (2008). Creating a nexus between homes and schools. In M. Lee & M. Gaffney (Eds. ), Leading a digital school. Principles and practice. (pp. 68-79). Camberwell: ACER. Lee, M., & Levins, M. (2010). Homes and the digital technology. A home-school difference or digital divide? In M. Lee & G. Finger (Eds. ), Developing a networked school community. A guide to realising the vision. (pp. 51-72). Camberwell: ACER. Lee, M., & Levins, M. (2012). Bring your own technology. The BYOT guide for schools and families. Camberwell: ACER. Lenhart, A., & Madden, M. (2005). Teen content creators and consumers. Washington: Pew Internet and American Life Project. Levin, B. B., & Schrum, L. (2013). Technology-Rich Schools Up Close. Educational Leadership, 70(6), 51-55. Mackenzie, J. (2009). Family Learning. Engaging with Parents. Edinburgh: Dunedin Academic Press. Maher, D., & Lee, M. (2010). Student Internet usage in a networked school community. The challenge. In M. Lee & G. Finger (Eds. ), Developing a networked school community. A guide to realising the vision. (pp. 241-258). Camberwell: ACER. Meir, D. (2002). In schools we trust. Creating communities of learning in an era of testing and standardization. Boston, MA: Beacon press. Molnar, A. S. (1997). Computers in Education: A Brief History. T H E Journal (Technological Horizons In Education), 24(11), 63-68. Prensky, M. (2010). Teaching digital natives. Partnering for real learning. Thousand Oaks, CA: Corwin. Project Tomorrow. (2011). The new three E's of education. Enabled, engaged and empowered: Speak Up 2010 National Findings. Sanders, M. G. (1997). Building effective school–family–community partnerships in a large urban school district. (Vol. 13). Baltimore, MD: Center for Research on the Education of Students Placed at Risk. Selwyn, N. (2009). The digital native - myth and reality. Paper presented at the Aslib: New Information Perspectives. Selwyn, N., Potter, J., & Cranmer, S. (2010). Primary Schools and ICT. Learning from Pupil Perspectives. London: Continuum. Shaw, A. (2008). Planning in a digital school. In M. Lee & M. Gaffney (Eds. ), Leading a digital school. Principles and practice. (pp. 30-37). Camberwell: ACER. Villa-Boas, A. (1993). The effect of parent involvement in homework on student achievement. Baltimore: Unidad, Winter (2). Wells, A. (2013). The Gonski review of funding for schooling. 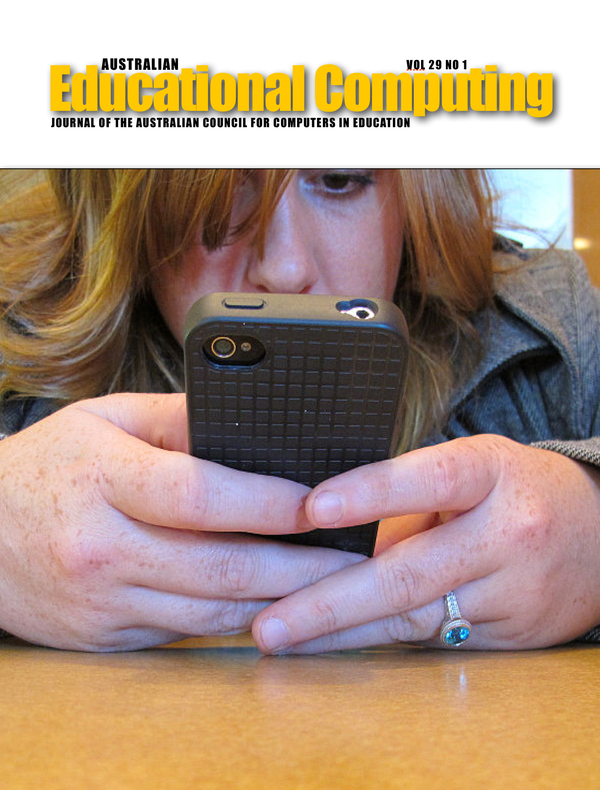 Education Technology Solutions, February 2013, 74-76.